El Dia de los Muertos, or the Day of the Dead, commemorates the lives of beloved dead. 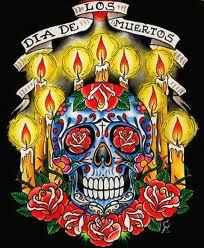 Day of the Dead is the Latino version of Catholic All Saints Day and All Souls Day, November 1 and 2. Dia de los Muertos traditions include creating family altars to honor the dead, visiting loved ones' graves and having picnics at the cemetery to be near the departed. Human skulls and skeletons are integral Dia de los Muertos symbols. Items are designed to look like skulls: candles, food and sugar skulls. People paint their faces to represent a skull (called a calavera). Some Halloween traditions developed from Day of the Dead but unlike Halloween, Day of the Dead isn't about scaring people. It's a religious holiday, culminating the Catholic holy days with pre-Columbian Aztec, Mixtec, Olmec and Toltec rituals of Mexico. If you need free printable Day of the Dead lesson plans to teach students about this popular cultural holiday, read on. Use the for homeschooled, public and parochial schooled kids. Tiki Chris at Flickr has designed awesome free printable skull patterns from one basic skull template. Print these in black and white for students to color. Or print the basic skull template and have a calavera skull decorating contest! This would make an excellent art or social studies project. Using one basic pattern, students can exhibit their creativity in design. Kids will love making connections with this beautiful heritage art from Mexico. QuestConnect.org has free printable Dia de los Muertos lesson plans and activities to thoroughly explore the Day of the Dead. Make papel picado banners, sugar skulls and skeleton crafts. Kids can learn the geography and culture of Mexico with an Oaxaca puzzle. Arty Ness has free printable Day of the Dead coloring pages, art projects, crafts with skeletons and skulls and more. Mr. Donn has a plethora of free printable Dia de Los Muertos lesson plans and activities. Use these for history, culture, geography and social studies lesson plans for middle school age kids. Enchanted Learning has free Day of the Dead lesson plans to print. A-Z Central has a whole website devoted to Dia de los Muertos activities. Print and make crafts. Listen to music. Learn about the culture of Mexico. Play games. Learn to make recipes and foods from Mexico. National Geographic has vocabulary lessons on Day of the Dead. There's an awesome picture gallery. Many parents, particularly Christian parents, don't celebrate Halloween. But don't mistake Day of the Dead skull for Halloween and ignore this rich, cultural festival. And don't let the skulls and skeletons freak you out. They show honor to the dead, not ghoulish fascination with death. These are as reverently handled as the nativity scenes at Christmas. And educators, if you teach ESL, please consider hosting a Day of the Dead party for students. It's good to learn about each other's cultures plus it makes Hispanic students feel more at home.